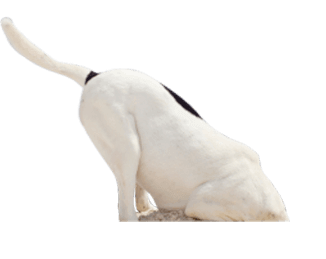 ** The Obedience Intake is a 1-hour meeting with owner(s) and dogs, during which we discuss your dog’s obedience issues and provide some initial training tips. 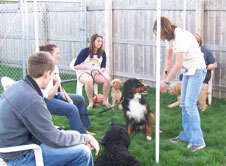 An Obedience Intake Meeting is required prior to starting Individual Training Sessions or Small-Group Classes. We currently do not offer private obedience training on weekends! At Just Dogs PlayCare, we specialize in private obedience training sessions. That means we meet with an owner and their dog to work on specific obedience issues and establish personalized goals for obedience. Because we think of dog obedience training as a collaboration between humans and their dog companions, we only offer training that owners attend with their dogs, as we feel it’s important that YOU learn training techniques. Your dog may perform well for an instructor—but isn’t it most important how he or she performs for you? Hours for Private Obedience Training: Monday through Friday: 8:00 AM-5:30 PM. We currently do not offer private obedience training on weekends. Another great option for those whose dogs attend daycare at JDPC is our “We Train, You Train”TM program! As we get to know your dog through regular attendance in our daycare play groups, we can assess the best ways to work with your dog on obedience training issues…and then meet to transfer the knowledge to you! If you think your dog would benefit from learning in a small group, please let us know! There are definitely benefits to both private obedience training and group obedience training. We prefer to do very small classes so we can give more one-on-one feedback to owners as they work with their dogs. A large group setting can be disruptive at times, with dogs often having a hard time focusing on learning. We use only Positive Reinforcement Training at JDPC. This means we will set your dog up for success by teaching what we want and then rewarding when the dog does it right. Treats, toys, happy voice, and lots of fun accompany the learning! Small classes allow much more individualized attention! 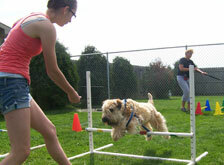 We often incorporate agility obstacles in our obedience training as a way to make learning more fun! Click on links below to see some tips on these obedience issues.